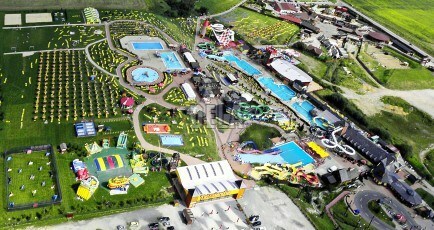 Aquapark Tatralandia is the largest water complex of fun and relax in Slovakia, open throughout the year. It is situated in the beautiful scenery of mountains, on the southern bank of the water-dam called Liptovská Mara, offering a view at the Western and Low Tatras mountains. It is only 2 km far from the town Liptovský Mikuláš and easily accessible from all main roads. Great fun is guaranteed by 30 toboggan tracks and water slides (9 of them are open throughout the year). Lots of sports facilities and adrenaline attractions are at your disposal and offer a lot of fun for your children, too. Tropical Paradise has been designed as a piece of a tropical Caribbean paradise with the average temperature of 30°C and with original tropical flora, Island of Pirates of Caribbean, a unique tropical complex with pools and a view over Tatra mountains, Vital world Celtic sauna world, unique complex of 17 sultry, water and massage baths, saunas and procedures are also a part of the Aquapark. We can find there a Wellness paradise and a congress centre. SURROUNDINGS: Liptovská Mara, Liptovský Trnovec, Bešeňová, Liptovský Mikuláš.